Ah, the Peloponnesian War; what would be a better day than to sit back and just read a book about it. What would make it better is to read a great book about it, like this one. Firstly, it is misnamed. The book goes back into history before the Peloponnesian War, and then continues with a full history of the war up until the duel at Amphipolis. The book then naturally goes through the history of the war in that period. What follows is an epilogue about what happened right after the death of both men. In the book, Brasidas is described as pretty much an unusual Spartan. He has many ideas that are not very Spartan in nature. He also appears to be rather quick thinking. This is another trait that the Spartans were not known for at the time. Cleon, on the other hand, shows up as a typical Athenian crowd pleasing type of politician. Brasidas is really the main character in the book once he shows up in the war. 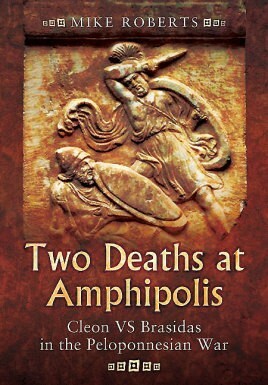 The clash between Brasidas and Cleon is at the end of the book, right before the epilogue. Brasidas and his very un-Spartan ways of conducting war, and his successful campaign in the north of Greece to attack the Athenian allied cities there, is gone into detail. Brasidas is an explorer and a man who seems to love adventure. He has in many ways an Athenian outlook, and not a Spartan one. The Athenians were very lucky that Brasidas died when he did. They were also lucky in that no other Spartans were willing to take up his mantle at the time. I have actually read this book about two times in the short time I have had it. This was mainly because it really gives the best information on the beginning of the Peloponnesian War. The book is also very clear and concise on the above history. I have read other books by the author and am looking forward to reading many more. Mr. Roberts co-wrote the two volume 'The Wars of Alexander's Successors'. He also wrote 'Hannibal's Road', a history of the Second Punic War in Italy. Do yourself a favor and pick up a book of his; you will not be let down. Thanks for the review, will look out for it.